A letter published in today's Mountain News caught my eye. The topic is a proposed pedestrian bridge crossing the Linc in the Dartnall area. Isn't infrastructure only repairing roads and underground sewers? What value is there in a pedestrian crossing of a freeway? Since newspapers don't write back, I thought I'd throw out some answers for the letter writer to consider. First, infrastructure involves a whole host of various projects. For the sake of argument, let's just talk about physical infrastructure needs in the transportation sector as it relates to this topic. From personal experience having walked/biked in that part of the city, I can assure you that there is a great need for this crossing. I suppose I could hop the sound barrier with my bike and try to run across the freeway to link up with the rest of the recreational/commuter trail, but something in my brain continually advises against that option. Infrastructure certainly involves roads (such as the highway we are now trying to safely cross) and sewers, but it also involves pedestrian, cycling and transit projects. There are tens of thousands of residents in Hamilton who don't own a car, yet they still pay taxes for all the highway and road repairs. Why? Because that's how society works. We all pay into a fund and out of that fund the needs of the citizens are met. All of the citizens. Granted, if you're a Hamilton resident who doesn't live downtown but relies on transit to move around the city, you could be forgiven for strongly disagreeing that all citizens are taken care of equally. Based on my experience as a car driver, cyclist, pedestrian and transit user, it is easy to see that cars are given a much higher priority than all other modes of transportation in Hamilton. Councillor Tom Jackson mentioned that this $2 million bridge will be paid for out of a total pool of $48 million that is earmarked for infrastructure. That sounds like a drop in the bucket to me. I wonder how much of the remaining $46 million will go towards car-related projects? If we're ever going to become a vibrant, livable city, we need to get past this mentality that I'm the only one who matters and everyone else's tax money should be spent on me. Every great city has excellent transportation options available, whether you want to drive, walk, bike or use transit. Hamilton, by contrast, has the highest lane capacity per person in Canada. With all due respect, this is the last city in the country where we should be asking "what value is there?" in an infrastructure project that isn't car related. 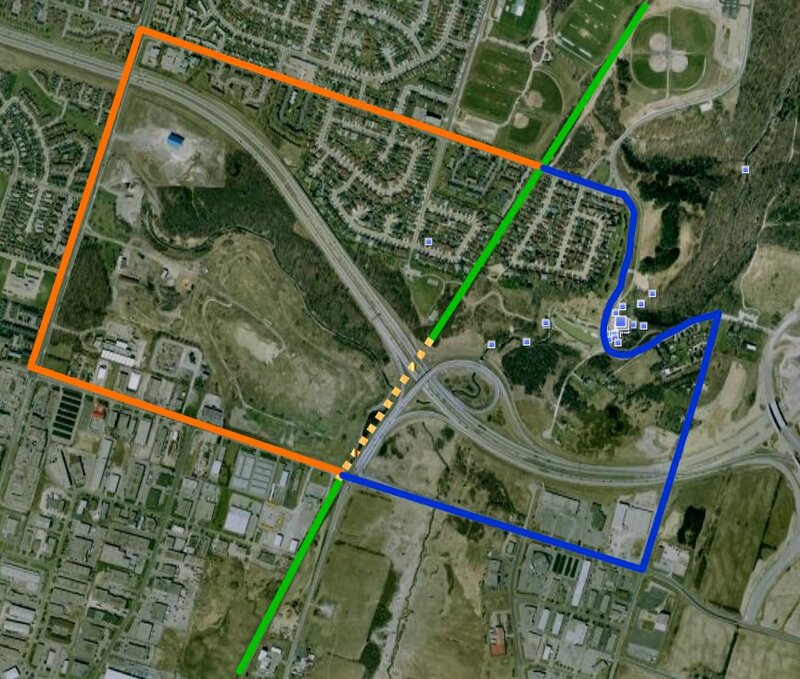 Green is current multi use (pedestrian/cycling trail) that is completely severed by the highway. Orange is one alternate route to get across the highway along three very long stretches of busy suburban roads. Blue is another alternate route along country roads. The dotted line is where a bridge might go (of course it won't be exactly there but you get the idea). Anyone who has eyes can see that there needs to be some accommodation for pedestrians and cyclists there. 2 mill is a ridiculous price for a bridge. It makes me wonder if Hamilton's construction companies are milking taxpayers on the back of their councilor election financing. How can you justify 2 mill for a poxy little bridge? (Is it made of glass?) I agree it's useful, even necessary, but how many bike lanes could you get for that price? probably a dozen bike lanes or a dozen potholes. I don't know all the in's and out's of this project. Perhaps the length of it spanning the highway is part of the cost. It's not very often that we spend $2 million on anything that doesn't fill up at the local gas station though. It's not like this is a routine expenditure out of city hall. If there is such a huge need, why don't you organize with the other cyclists/pedestrians and finance it yourselves? You could charge a nominal toll and if the benefit to users was greater than the cost, you would make money on the deal. Otherwise, you have zero idea how important this crossing is and therefore is just another waste of precious capital. If the money is coming from taxpayers anyway, why not just take it in the form of a toll? That way, only the people who benefit pay. Seems fair to me and that's probably why you won't support it. ^^ dont feed the troll!! ^^^^ Why didn't east mountain homebuilders organize and fund the expressway themselves? Jonathan, >> Why didn't east mountain homebuilders organize and fund the expressway themselves? Because voters allow politicians to spend their hard earned dollars for them. If people told the politicians to cap tax rates at .5% of assessments, at least government would be limited in the amount of stupid things it could do. That 0.5% figure would still give politicians enough money to take care of the basics, so any new projects would need to be funded by the individuals involved. It simply isn't a good idea to give people who don't earn money, the ability to spend it. They don't feel the need to spend it wisely, as every person who works for his/her own money does. Thanks for this post. It's so true. I moved back to Hamilton about three years ago after living in Toronto for six years, and I was immediately struck by how much of a "car-city" Hamilton is compared to Toronto. I've never owned a car myself (I actually like walking and taking public transit to and from my destinations, strange I know) so as a transit rider and a pedestrian I can say first hand that Hamilton is much more difficult (and annoying) to traverse then Toronto. I'm lucky that I live in the western end of downtown because I'd imagine the Mountain (aka suburbia) must be many times worse. I'm not surprised that that letter about infrastructure funding being wasted on pedestrian bridges was written for and published by the Mountain News; people on the mountain especially love their cars. Have you ever tried going for a walk on the Mountain? The only people you pass on the streets are teenagers (who presumably don't have their licences, yet) and seniors (who, you know, come from a generation that understood that walking wasn't just something you did when one was too poor to afford a car). I'm looking forward to the upcoming remodeling of the street scape along Longwood which connects Westdale to Aberdeen. Currently, making your way by foot either to or from Westdale to downtown isn't the best experience. You either have to travel over one of the 403 bridges (the Main Street one being particularly awful considering you're basically walking over a highway on a highway), or along Longwood which is basically a desolate brownfield (and on a windy day, a very powerful wind-tunnel); I'm really hoping that McMaster and its partners will create a bike/transit/pedestrian friendly strip along Longwood because a decent walking route to or from Westdale to the city is badly needed! "...I was immediately struck by how much of a "car-city" Hamilton is compared to Toronto." It's important to keep a perspective. Any city in Ontario is a "car-city" compared to Toronto. Hamilton actually has good transit and bike culture compared to most municipalities. Even the east and central Mountain has pretty good bus ridership and pretty good HSR access to downtown. moseby and LL, great posts and great observations. It's important to remember that the urban neighbourhoods in both Hamilton and Toronto were built at the same time and designed in a similar, walkable manner. We used to have streetcars in Hamilton that ran down the centre of major lower city streets like Toronto's streetcars do today. Just the simple act of tearing up our tracks and replacing them with buses was a huge leap towards becoming a car-centric city. In Toronto, cars all wait as streetcars stop and load/unload. Queen/King in Toronto have parking along both sides with one lane of traffic each way, and that single lane of traffic has streetcars that have right of way. Hamilton has destroyed that design and now, even as we move forward with good plans such as two-way conversions on York, James, John etc.... we refuse to simply go back to a 4-lane cross section with street parking and a single traffic lane in each direction (other than rush hours). We keep doing these two-way conversions that are overloaded in the direction of the current one way traffic. But at least it's a step in the right direction. I believe future generations will go the rest of the way and be done with these un-balanced two-way conversions. In Hamilton, car drivers consider buses, annoyances in the curb lanes that are there to be passed whenever possible. Just that one mistake of tearing up our streetcar tracks set transit WAY back and elevated the status of the private car WAY forward in people's minds. I love sitting on a patio on College St in Toronto and being able to talk to my dinner partner without yelling or waiting for waves of traffic to roar by. Traffic is slow, steady and best of all, quiet. I'm hopeful that in the future we'll reclaim one of the extra eastbound traffic lanes proposed for the York Blvd two-way conversion for street parking and that LRT will appear on King and Main. Moseby, you want to hear the Mountain folks scream, watch what's going to happen when they hear about plans for an on-street rail system that has right of way and control over stoplights on King and Main. Many of them love to visit Toronto, but they're going to fight tooth and nail against any attempt to bring some of that Toronto (and former Hamilton) street success here. "For the first time in 15 years, Ontario is increasing driver and vehicle licence fees to ensure provincial roads and bridges remain safe and in good repair for future generations. - farm and off-road/snow vehicles. The revenue generated from the fees will help support the maintenance of provincial roads, highways and bridges. Even with the increases, Ontario's passenger vehicle licence fees will remain lower than many other provinces in Canada. The government will not be moving ahead with the recommendation to charge parking fees at GO Transit parking lots."